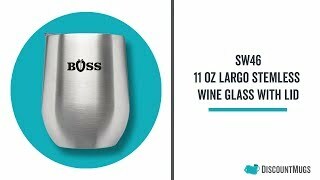 These stainless steel wine glasses (minus the stem) feature a double wall insulated built that is proven to keep wine chilled longer than glass. Beautiful gifts that will impress wedding guests, clients or employees, these can also keep hot drinks warm for up to 3 hours. The chic stemless design holds up to 11 ounces, is BPA Free so you don’t have to worry about harsh chemicals, has a popular shinny finish in your choice of black, blue, red, gold, fuchsia, purple, silver or teal, and include a clear plastic lid with drinking hole so you can enjoy on the move. Available at guaranteed cheap wholesale prices, our stainless steel stemless wine glasses with lid also feature our Free Shipping offer or select orders. Start designing online or upload your custom artwork - printing and laser engraving available. Love this product. Looks great! Good quality.